The eye drops Thealoz help relieve you of irritation and eye fatigue. 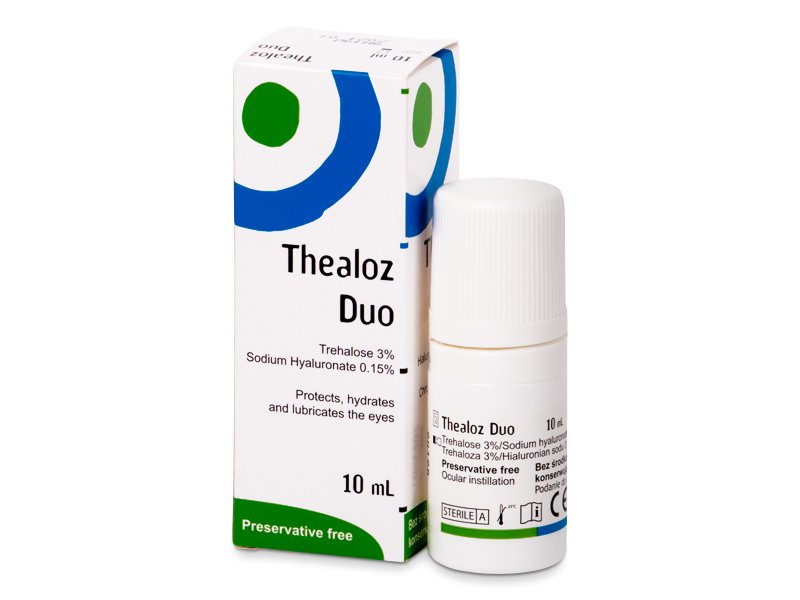 This neutral (pH 7) formula lubricates the surface of the eye and effectively combats dry eye syndrome. You may apply around 4–6 drops per day, if necessary. Thealoz Duo drops do not contain preservatives and can be used while wearing contact lenses. This packaging contains 10 ml. Usable up to 3 months after opening. Thealoz Duo makes use of the patented ABAK dosing system, which delivers a consistent drop each time. This unique dosing system also helps keep out dirt, bacteria and contaminants, keeping your drops sterile. You state your price of £13.49 for this product is the best price found anywhere? What a load of rubbish. This is the same price as in Boots and they're normally the most expensive for eye lotions! You must try harder! Hi, Brian, You can use as many as possible, one at a time. However, it is extremely unwise to mix eye drops. Hi, Pat, Unfortunately, we do not offer eye-drop applicators. We would suggest checking the Thealoz website.